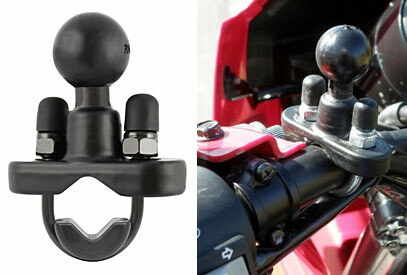 RAM® Mounts utilizes a patented rubber ball and socket design which isolates and dampens shock and vibration allowing you to mount just about anything, anywhere on your motorcycle, ATV, or UTV. RAM is made of marine grade aluminum wit a powder-coated finish, stainless steel hardware and Nitrile rubber balls. 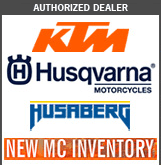 All backed by lifetime manufacturer's warranty. Universal X-Grip cell phone cradle with 1 inch rubber ball. Works with devices that are up to 3.25 inch wide. Universal X-Grip smart phone/tablet cradle with 1 inch rubber ball. Works with devices that are up to 4.5 inches wide. Connects to the left or right side of your handlebar clutch/brake clamp and holds one 1" diameter mounting ball. Have an M8 by 25, 30, or 35mm handlebar bolt? The RAM-B-367U will replace that bolt with a standard ball-mount to put just about anything there! 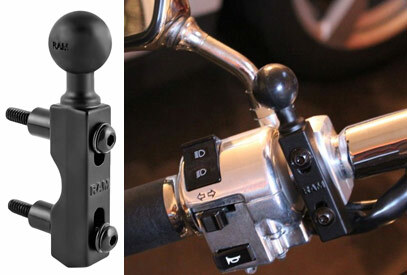 Ram U-Bolt Base w/Ball Motorcycle handlebar base designed to mount on bars 7/8 to1 1/4 inch diameter. Provides a 1 inch rubber ball to mount from. 6 inch double socket arm for 1 inch ball bases, overall length: 6 inches socket-to-socket: 5.25 inches. overall length: 3.69 inches socket-to-socket: 3 inches. 2 inch double socket arm for 1 inch ball bases, overall length: 2.38 inches socket-to-socket length: 2 inches. Includes a M10 x 1.25 pitch male thread connected to a 1 inch rubber ball. SAE spec convex lens mirror is easy to fold, remove, or swap between bikes. Made from reinforced Zytel and indestructible. Mirror dimensions: 135mm x 90mm (5.25" x 3.5"), Overall length = 175mm (7"). Made in the USA. SAE spec convex lens mirror is easy to fold, remove, or swap between bikes. Made from reinforced Zytel and indestructible. Mirror diameter: 100mm (4"), Overall length: 215mm (8.5"). Made in the USA. The RAM X-Grip® has a clean and clever four leg design that sports great holding power without hiding your phone behind foam pads and plastic. The perfect compliment to the modern sleek interior of today's vehicles, the RAM X-Grip® is the cell phone holder evolved. Compatible and interchangeable with a wide range of popular RAM Mounting products, this elegant holder is ready to compliment your phone and become the most useful accessory in your vehicle. Have an M8 by 25, 30, or 35mm handlebar bolt? The RAM-B-367U will replace that bolt with a standard ball-mount to put just about anything there! This part is compatible with any motorcycle which employs an 8mm bolt or smaller on its structure. A smaller bolt can be used, though the load capacity decreases with the bolt size. Package includes: 1" Rubber ball (QTY. 1), M8 x 55 bolt (1.25 thread pitch) (QTY. 1), M8 x 60 bolt (1.25 thread pitch) (QTY. 1), M8 x 65 bolt (1.25 thread pitch) (QTY. 1), Material: Marine Grade Aluminum, Ball Size: B Size 1" Rubber Ball, Attachment Point: Motorcycle handlebar top clamp, any bike that uses an M8 threaded bolt. Note: The "U" in the part number reflects product packaged in poly bag. To determine if these bolts are compatible with your motorcycle measure the bolt for the diameter and add 30mm to the length. If it matches one of the 55, 60, or 65 mm length, then you can use the appropriate bolt supplied with the mount. If it does not match, you may be able to source the correct length of bolt locally or from your BMW dealer. Be sure to use the correct torque spec when attaching the mount. The double socket arm, has a socket at both ends that accommodates 1" ball bases. A single spring inside the arm opens the end sockets, allowing you to pivot the ball and socket connection. This socket technology allows for almost infinite adjustment and perfect viewing angles. The RAM Tough-Claw™ is the perfect mounting base for quick and easy tool-less installation and removal on round, square, odd shaped rails and bars. The Tough-Claw™ can be clamped on rails from 5/8 to 1 1/2 inch diameter. Ideal for mounting tablets, action cameras, smart phones, rod holders for rod storage and much more in a wide variety of applications. Perfectly suited for mounting on the yoke of an aircraft, handlebars and seat posts of bicycles, kayak rails, roll bars and much more, the RAM® Tough-Claw™ will soon become another essential RAM® component in your collection of mounting options. Made with high strength composite and stainless steel hardware. Note: The threaded hole must have the following dimensions for this product to fit: M10 x 1.25 pitch with a—.5mm flange diameter with a 10.15mm thread length.